The Chiesa Madre of Cutro. 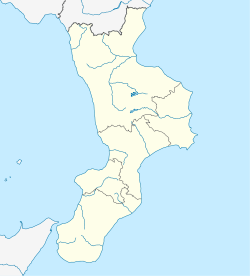 Cutro (Calabrian: Cùtru) is a town and comune in the province of Crotone, Calabria region, Italy. It's called "City of chess". It is the place of birth of Vincenzo Iaquinta, World Cup-winning footballer who played for Serie A club Juventus. Cutro was a Greek colony of Magna Graecia, with the name of Kyterion. It obtained the title of city in 1575 by the Spanish King Philip II, after the local chess champion Giò Leonardo Di Bona had won a contest at the Spanish court, become first international winner of chess. Cutro was destroyed by an earthquake on March 8, 1832. It remained the most populous centre of the region until the mid-20th century, when a strong emigration flow towards Germany and northern Italy (especially in Reggio Emilia) reduced the number of inhabitants considerably. This page was last edited on 17 May 2018, at 18:02 (UTC).